WEATHER: very cold for most of the morning despite bright sunshine, warmer in the afternoon. It was a bright and breezy start to the day with plenty of sunshine but with a very cold easterly wind. We set off on foot from the hotel at 7:30 and headed to a local dumping site about a kilometre away. 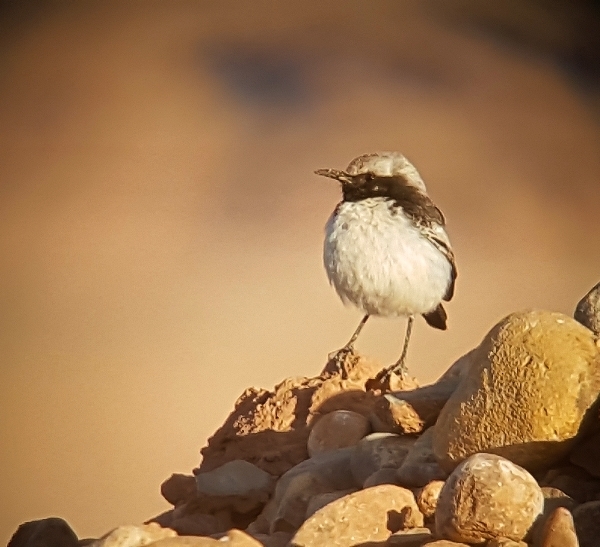 We quickly found both Desert and Red-rumped Wheatears, they were both males but the Desert Wheatear chased off the other guy before everyone had a chance to see it. Not too far away we found a second Red-rumped Wheatear which did show well. Next came Thekla Lark and a small group of flighty Trumpeter Finches and all the time we were out there groups of migrating Barn and Red-rumped Swallows flew north-eastward keeping low to the group because of the wind. 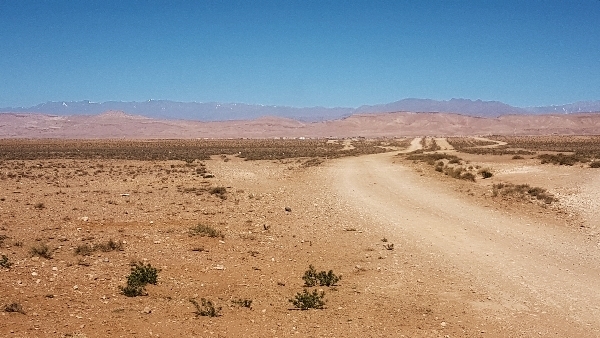 We hopped onto the bus which had been following us and drove to a rubbish tip which was found at the start of the Tagdilt Track, so called because to leads to a village called Tagdilt! It was hard going in very cold conditions but we managed to see a fair number of birds as we walked to the centre of the rubbish tip. 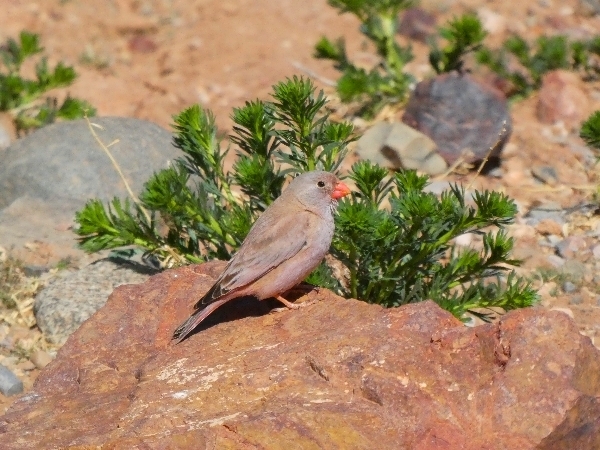 Small flocks of 20-30 Short-toed Larks made regular appearances as did both Desert and Red-rumped Wheatears, Thekla Larks were also common as were Northern Wheatears and Temminck’s Larks. Other species seen during the first couple of hours included; Eurasian Hoopoe, both White and Yellow Wagtails, White Crowned Wheatear, Woodchat Shrike, Black Kite and Marsh Harrier. Moving around the general area of the tip we searched in vain for a Thick-billed Lark, but instead we bumped into a large flock of Wagtails, a mixture of White and Yellow varieties. 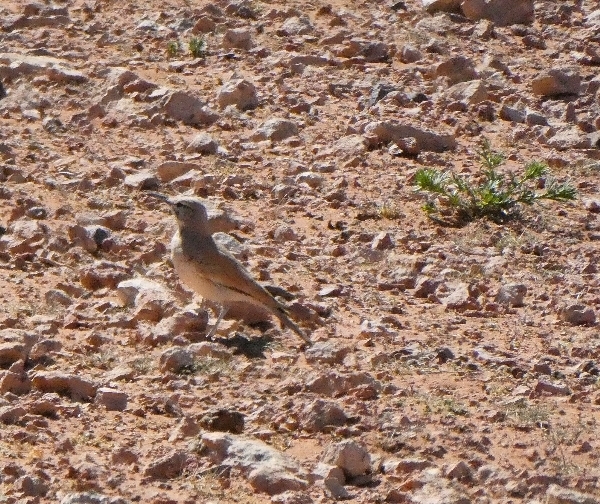 We also found 3 Meadow Pilots and then we got onto a small flock of Sandgrouse flying in the middle distance. We located them on the ground but they took flight again as a male Marsh Harrier flew over them, we counted 11 Black-bellied Sandgrouse. 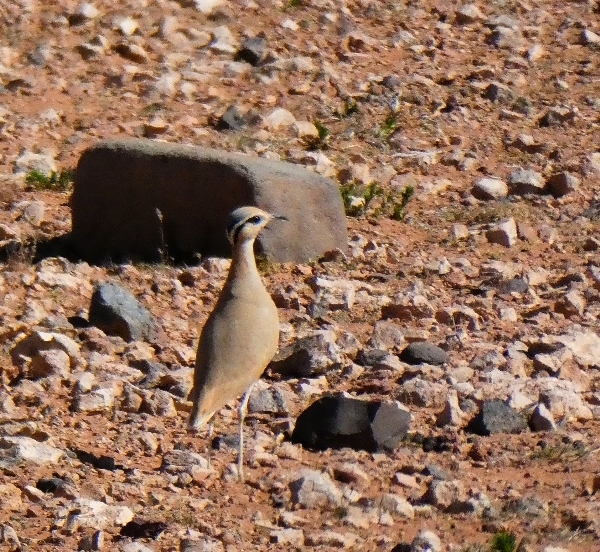 From there we boarded the bus and drove further along the Tagdilt Track, stopping to look at Wheatears and Larks, we found our first Desert Lark and soon afterwards we bumped into small numbers of Cream Coloured Coursers. 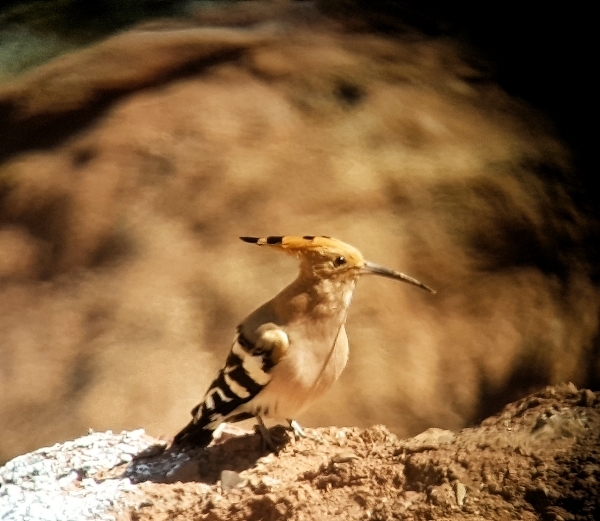 Over the next 30 minutes we saw a dozen or so more Coursers and a pair of Hoopoe Larks. A pair of Long-legged Buzzards circled over us at some stage. With our target list almost complete we drove off the stony ‘regs’ and followed a metalled road to a small farm holding with a variety of fruit and nut trees and small fields of alfalfa. We were disappointed with our finds there which were few and far between. Common Bulbul, Eurasian Hoopoe, Woodchat Shrike, many common species but no migrant warblers. 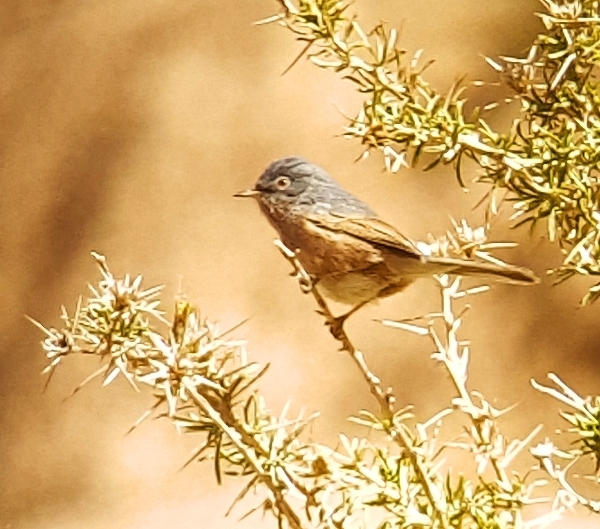 A few of the group saw a Common Redstart and we all had great views of Trumpeter Finch but not much else. After driving into Boumalne to buy lunch we then drove up the Dades Valley toward the famous gorge. 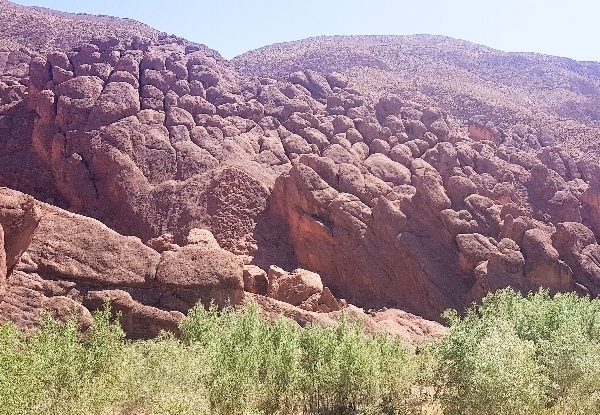 We stopped to eat our picnic lunch at site of great geological interest where very unusual rock formations can be seen. We noted Eurasian Hoopoe and European Serin there and we heard a Common Nightingale. The drive up through the gorge was fantastic, what a beautiful place and the views from the top are just just stunning. Also at t the top of the gorge the landscape changes to steep sides scree with low scrub bushes, this is the home of the Tristram’s Warbler, we found a pair within 10 minutes of looking, they showed reasonably well, we also saw Crag Martin, House Martin, Blue Rock Thrush and Black Wheatear. After a quick cup of coffee at the head of the gorge when we sat overlooking some stunning scenery, we drove back down the steep, twisting road and got out of the bus again at the bottom to visit a wooded area near the river. Apart from common garden birds we saw little else, we did hear European Bee-eaters but our view of the sky was obscured by trees so we never saw them. After returning to the hotel at 5:30 some of the group went out for walk but did not record any new sightings for the trip. We all ate dinner at 8pm before retiring for the night.